When older adults don’t get enough vitamin D and calcium, bones can thin and weaken, which means they can fracture or break more easily. Vitamin D also helps to keep muscles strong; when yours aren’t as strong anymore, you’re more vulnerable to falls. Sometimes, people refer to this vitamin as the “sunshine vitamin” because your skin can make vitamin D with sun exposure. But, your skin’s ability to create this vitamin declines with age, and this strategy also comes with an increased risk of skin cancer. You can get vitamin D by eating salmon, swordfish and mackerel, for example, plus milk, juice, yogurt, cereal and more that’s been fortified. As far as a vitamin D supplement, an expert quoted in BetterHealthWhileAging.net recommends a supplement of 1000 IU/day for most older adults. The American Geriatrics Society suggests that medical professionals tell their older adult patients to take this amount to help prevent fractures. Because older adults often spend limited time outdoors, they are at risk for deficiency. For the majority of older adults, taking this vitamin D supplement presents little opportunity for harm. 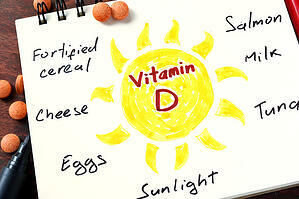 Research shows that this amount of supplementation will typically prevent low vitamin D levels. These findings held true even when controlling for multiple factors and, when excluding people from the study who took anti-depressant medications and vitamin D supplements, findings didn’t change. Because this vitamin can be created through sun exposure, deficiencies can be more common in winter – and an article in Health.USNews.com offers tips to maintain vitamin D levels during the darker months. First, focus on eating the right foods. You might be surprised by how much of this vitamin you can get when you eat strategically. A single serving of canned tuna, the article reveals, provides about one-third of what you need for an entire day. And, during a week’s time, you can eat seven eggs enriched with this vitamin as protection against deficiencies. When the weather is “slightly warmer,” take a walk. You’ll need to have some skin exposed for this strategy to work, so it wouldn’t be effective or recommended on bitterly cold winter days. Not all experts believe that vitamin D supplements are a good idea. Here is information about relevant research and dissenting opinions, including how a 2018 report by the Journal of the American Medical Association showed unimpressive results in preventing falls.